An official schedule of courses is issued each semester before registration. Students should consult this schedule for information regarding credit hours, class times, classroom assignments and instructors. Course prerequisites and other enrollment limitations are noted under course listings in the Catalog and/or in registration materials. Courses for the D.Min. Program are taught during four two-week Intensive Sessions, conducted over two years in August and in February. Students in the program are encouraged to stay together as a cohort through the four Intensive Sessions, to facilitate peer learning and group reflection. For this reason also, R.E. and M.Div. students are not permitted to enroll in D.Min. courses. Procedures for registration, orientation, developing the learning contract, leaves of absence and other policies are described in the D.Min. Handbook. Registration occurs at stated times prior to the first day of classes. Registration requires the signature of the academic advisor, as well as the payment of tuition. Continuing students may register online through the Student Information System after their academic advisor removed the advising hold. Students may add and drop courses up to seven days following the first day of classes in any term. Registration forms and add/ drop forms are available through the Registrar’s Office. In addition to transcripts, the Registrar keeps a record of each student's fulfillment of program requirements on a personal worksheet. Copies are given to students to help them in their program planning. Students may enroll in a course as auditors with permission of the professor. Auditors are expected to attend classes on a regular basis. • The student has earned a minimum grade of C with full credit. • The maximum number of credits for a course transferred is the number of credits UTS awards for the corresponding course. Transfer credits normally apply to credit earned prior to attending UTS. Students enrolled at UTS who interrupt their studies to attend another school may not transfer those credits without prior approval from the Vice-President for Academic Affairs. Transfer credits should be considered upon entry into a degree program. Transfer credit request forms and additional information are available from the Registrar. Transfer credit will not be accepted for the Doctor of Ministry Program. Under certain conditions a required course may be waived. For further information inquire at the Registrar's Office. Withdrawal from a course after the add drop period requires the approval of the instructor and the Academic Advisor. Course withdrawals are permitted up to but not including the last week of the term. Failure to withdraw from a course results in a grade of F for the course. Students will be considered to have withdrawn from a course if they miss 4 weeks of classes during the first 7 weeks without giving written notification. The academic year is comprised of Fall and Spring semesters of approximately equal length. Terms include fifteen weeks of instruction and a final examination period. The January intersession provides an opportunity for intensive courses. Although commencement exercises take place only in May, students may graduate either in May or December. Students who graduate in December may participate in the commencement the following May. Students preparing to graduate must fill out a Graduation Application when they register for their last term of study and pay the Graduation Fee. Application deadlines for graduation are September 30 for December graduation and March 30 for May graduation. The Registrar will prepare a degree audit, which will advise the student about remaining courses needed for graduation. Students intending to graduate are expected to complete all program requirements, including ESL program requirements, the Mid-Program Review and RE Project, by the last day of examination period of the term they intend to graduate. Incompletes from previous terms must be cleared and the Divinity Thesis completed three weeks before graduation. Students with incompletes on Graduation Day may still be counted as graduates for that day if their late work is completed 30 days after graduation. At the beginning of their Seminary study, students are assigned an Academic Advisor from the faculty. They may continue with the advisor or request another during their time at the Seminary. Academic advisors check student advisees' progress based upon their worksheets and transcripts. They approve their student advisees' plans of study at registration each term. 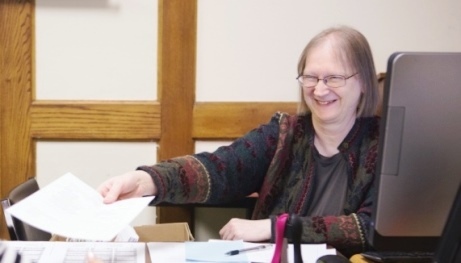 Faculty members post their office hours at the beginning of each term and are available for student conferences at those times or by appointment. The Academic Advisor will assist the student in proper course selection to meet degree requirements. Each student should keep in mind, however, that he or she alone is ultimately responsible for understanding and fulfilling all graduation requirements. Students are responsible for their own degree plans and for the completion of all requirements for the degrees that they seek. Any questions about graduation requirements should be brought to the Registrar. Each student’s work shall be the product of his or her own effort. Plagiarism and other acts of academic dishonesty are serious violations of academic integrity. The penalty for a violation of this nature is disciplinary probation, suspension or dismissal. Given the expectation that students will attend all sessions of the courses for which they are registered, faculty members may establish attendance requirements in their courses and take this into account in evaluating the work of a student. Whenever unusual circumstances make regular attendance impossible, special arrangements should be made with the instructor. A full course load in a given semester consists of 9 to 12 credits or participation in a full-time field education internship. Registration for more than 16 credits requires approval of the Vice-President for Academic Affairs. One credit is awarded for each 120 hours of field education internships. Students who are employed in a full-time internship normally work 40 hours per week, and thus they earn 1 credit for every 3 weeks of work. Students who spend an entire semester in a full-time field-education placement will ordinarily earn 5 credits; nevertheless they are considered by UTS to be enrolled full-time in the program. Students enrolled in classes can also work part-time at a local placement; by working 15 hours per week a student can complete 2 credits over the course of a 16-week semester. Religious Education students may take a maximum 8 credits of field education. Divinity students may take a maximum of 11 credits. Students in one of the two academic concentrations in the M.A. program may take a maximum of 3 credits if their placement is directly relevant to their concentration; students in the two professional concentrations may take up to 6 credits. The Mid-Program Review is an important assessment tool for UTS students, affording them an opportunity to reflect on their learning goals, vocational plans, vision and calling. Students normally take the MPR in the term after they complete 24 credits, or for transfer students, after completing their first 12 credits at UTS. Students assemble a portfolio consisting of 3-4 items that best represent their learning at UTS. They prepare a written statement assessing their life goals and learning goals, progress towards attaining those goals, and future plans. Each student then meets for an individual interview with a committee of one faculty member and two students, and discusses with them issues raised by the portfolio and written statement. While the primary purpose of the MPR is to help students assess their progress, satisfactory completion of the MPR is a requirement for graduation. Independent study is intended for students who wish to explore aspects of a program area that are not part of the current curriculum. Students who have completed 24 credits may register for Independent Study by submitting to the Registrar a written proposal approved by the instructor and the Vice-President for Academic Affairs. Students are expected to meet with the instructor at least four times during the Independent Study. Students may undertake one Independent Study per term and not more than two per year unless approved by the Academic Affairs Committee. A course may be offered as Directed Study when there is insufficient enrollment for a class. Normally Directed Study is offered only for courses required to complete degree requirements or for ordination. Students are expected to follow the course syllabus and meet with the faculty member at least once a week. Due to reduced contact hours, a course taught as Directed Study may require more work outside the classroom than a normal course. The Religious Education Project is the capstone of the R.E. Program, integrating knowledge gained from other Seminary courses with the skills and knowledge gained from Religious Education courses, and applying this knowledge to address a specific issue, problem or interest in the field of Religious Education. Students work on their R.E. Project under the guidance of the Religious Education Program Director. Students begin preparing for the R.E. Project two semesters before their intended date of graduation by submitting a proposal to the Religious Education Program Director for approval. Students may propose a research paper or to develop a project, such as designing an educational resource tool, curriculum or similar activities, that contributes to the field of Religious Education. The timeline for the Religious Education Project requires that the students have a draft of their paper or project ready for presentation at the R. E. Colloquium during their final semester at UTS. Based on comments received at the presentation, students prepare their final draft. Students are required to submit two copies and a PDF copy on a flashdrive of their R.E. Project plus an abstract to the Library, making it available to future students. The Masters Project or Thesis is an in-depth field project or research paper. Students taking one of the academic concentrations will write a traditional academic research paper. Students taking one of the professional concentrations may either write a paper or pursue alternatives such as video and web-based projects or work products useful to the organization where they have been serving as interns in the context of their field education. Students are guided in the preparation of their Masters Project through enrollment in the year-long Masters Colloquium during their senior year of study. In the first semester, the colloquium provides guidance on formulating the project proposal, deciding on a research methodology, and helping in the initial stages of research. In the second semester, students present their work in progress to the class and bring it to completion. The steps involved in writing the Master Project or Thesis are: (1) Select a Thesis Advisor who will guide the preparation of the Project/Thesis – the student will meet with this Advisor regularly to prepare the proposal and review drafts; (2) Prepare a Project/Thesis Proposal, which defines the topic and outlines the content of the project/ thesis – requiring approval by the Director of the Master of Arts Program, the Project/Thesis Advisor and the Vice-President for Academic Affairs – due by mid-October (mid-March for December graduation candidates); (3) Re-search and write the first draft, due by mid-February (mid-September); (4) Complete the Project/Thesis by the end of April (November) and submit it to the Advisor for approval; and (5) Submit two clean paper copies, a PDF copy on a flashdrive, plus an abstract to the Library prior to graduation. A complete description of this project and the steps to prepare it from the initial proposal to the final defense are described in the Doctor of Ministry Handbook. F’s assigned to pass/fail courses do not compute into the G.P.A. I Incomplete. Not computed into the G.P.A. P Pass. Assigned only in selected courses (e.g. Field Education). A “P” denotes a grade of “C” or better. Instructors may, at their discretion, grade Independent Study on a pass/fail basis. Not computed into the G.P.A. The Master of Arts Thesis is graded Pass/Fail. An exceptional thesis may receive Honors. The Doctor of Ministry Dissertation is not graded, but leads to a Dissertation Defense. Incompletes are given only when there are compelling medical or personal reasons. Students who fail to turn in assignments will be awarded an appropriate grade. Students who receive an Incomplete have one term to make up the course work. At the end of the following term, if the Incomplete has not been resolved, the student is assigned a grade of “F,” which is irrevocable. If the course is a core requirement, the student will then be required to retake the course. Students with more than 12 credits of incompletes cannot register for another term. Incompletes are also assigned if a course or project is expected to last longer than a semester. Students have a reasonable time to complete the work, however, the Incomplete grade will be changed administratively to an F either two years after registering for the course or after the student has been inactive for two semesters due to withdrawal, leave of absence or attending commencement. In Progress grades are given for courses in which a student is enrolled, but the term has not yet ended and/or final grades have not yet been submitted. Students who are working on completing their Religious Education Project or Master of Arts Thesis/Project and are not otherwise registered for courses are required to register for the “Continuing Thesis/Project Enrollment”. This course enables them to continue to use the Seminary resources and will be counted as half-time enrollment. “Continuing Project Enrollment” is limited to two semesters maximum. A minimum grade point average of 2.50 is required for satisfactory academic standing. If a student's G.P.A. falls below the minimum after completing 12 credits, the Vice-President for Academic Affairs will place the student on academic probation. If during this probation period the student fails to lift his or her G.P.A. to 2.50, he/she may be dismissed. The Dean’s List is published at the end of each term. It lists the names of students who have achieved a grade point average of 3.75 or above (for at least 9 graded credits) and who have completed all work for the term. UTS maintains records concerning vocational interests and academic accomplishments of its students. The school recognizes the student’s right of privacy and maintains a policy of confidentiality regarding the information, which becomes a part of the student’s permanent record. Copies of the official policy are available from the Registrar. Students are able to print student copies of their transcript through the online Student Information System. Official transcripts are issued for a fee upon the student’s written request to the Registrar’s Office. Transcript service will be withheld for those with outstanding debts or other obligations to the Seminary. There are two kind of transcripts: official transcripts with signature and seal of UTS in a sealed envelope; and student copies of transcripts. Official transcripts cost $7.00/US each and will be sent preferably to the address of the prospective school or employer. Acceptable payments are in cash, check, moneyorder, and Visa or Mastercard. Official transcripts will be mailed only after receipt of the fee. Any special delivery charges (e.g. Express Mail) will be added to the cost. Students copies are free and will be sent to the student's address. In order to release any transcript - official or student copy - the student needs to sign a release form. Please print out the following form and mail or fax it to UTS, attn. Registrar's Office. If you don't have a printer available, a handwritten request with the information asked for will do just fine. Students may interrupt their program of study for a leave of absence by filing a request with the Registrar. Normally a leave of absence is granted for one term only. Unreported leaves of absence may be taken as evidence of a withdrawal from the Seminary. The D. Min. Handbook describes the policy for a leave of absence for doctoral students. F1 students must speak with the Primary Designated SEVIS Officer (PDSO) if they are considering a leave of absence as special conditions apply. A student withdrawing from UTS is asked to notify in writing the Director of Admissions and/or the Vice-President for Academic Affairs. Students may be asked to consult with the Vice-President for Academic Affairs in person. If a student extends his/her leave of absence for more than 2 terms, it is considered to be withdrawal from the Seminary. Students who have withdrawn must apply to the Admissions Office for readmission. Readmission is processed through the Admissions Committee. Final approval is granted by the President. Students who withdrew or who were withdrawn and subsequently re-apply are required to follow the curriculum in effect at the time of their readmission. There is an exception for students who have only to complete their thesis/project. Those students may graduate under the curriculum in effect when they previously were enrolled. In order for UTS as an institution to continually improve and support students in achieving their learning goals, assessment must be central. The Seminary seeks student support in this effort through their honest and clear responses on assessment surveys and instruments. In this way, not only will they benefit, but all future students who attend UTS will benefit. Students at the NYC Campus have access to the information commons in the Library, which offers computer support and printing support. Students are also able to check out Chrome Books while on campus. In addition, students may request research support from the Library staff. All ss are required by law to provide reasonable accommodations in the form of auxiliary aids and services for students with disabilities. These accommodations may include, for example, taped texts, note takers, interpreters, readers, Braille books, large print materials, talking calculators, television enlargers, assistive listening devices, video text displays, and test accommodations. UTS will determine on a case-by-case and course-by-course basis whether a need exists, based on documentation, and what accommodation is appropriate.